Sekiro: Shadows Die Twice is a phenomenal game, but if there’s one thing about Dark Souls I miss, it’s the ability to change clothes. I’m pretty over that drab orange coat at this point. But fortunately, us PC players can now freshen up our protagonist with the Costume Pack Mod, which replaces Sekiro’s character model with your choice of other options taken from NPCs. After an update, there are a total of 25 costumes on offer. These include bosses such as O’Rin of the Water and Lord Genichiro, a Nightjar ninja (aka, ‘wooo guy’), a monkey, and – crucially – a lizard. You can see the results in the video below. If you’re already convinced, head to Costume Pack Mod on Nexus Mods. The model swap comes courtesy of modder and Souls YouTuber Zullie the Witch (who is also, incidentally, a named character in Dark Souls II, and may or may not be the mother of Karla, a quest-giver and NPC in Dark Souls III). 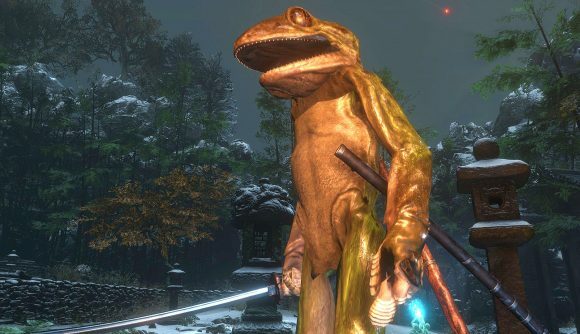 Modders are having a lot of fun with Sekiro. One has decided the game isn’t mean enough and has Hidetaka Miyazaki’s devilish face appear to mock you each time you die. If you’ve still not taken the plunge, here’s our Sekiro: Shadows Die Twice review, and here’s the Steam page. In short, it’s a brilliant game, and while it’s pretty punishing at first, it gets a bit easier once everything clicks. if you’re up for the challenge, you really should play it.